Chocolate cravings. They always find a way into your head. There’s just nothing quite like the taste of chocolate. 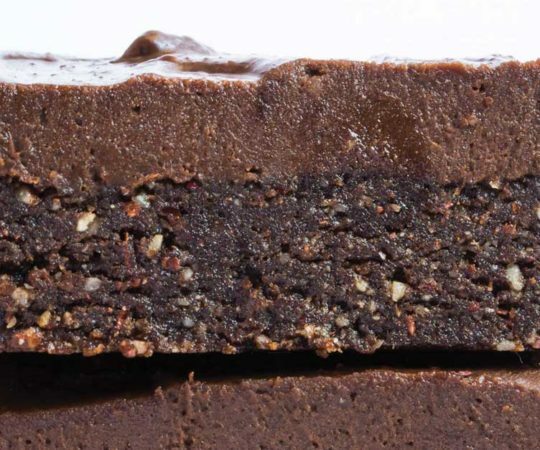 So I am elated to uncover this raw brownie recipe that combines dates, walnuts, and cocoa powder to make a delicious, Paleo-friendly treat. And the recipe is so simple! They take under 20 minutes to make, so I have found myself repeating this recipe almost every week. Too good to be true? Try them for yourself and see! You simply blend everything together, and then roll the ‘dough’ into bite-size brownie balls. They way that I roll the raw brownie mixture usually yields about 8 medium-sized brownie bites, but you can make them even smaller or larger depending on what you like. Sometimes I roll the finished brownie bites in chopped nuts or dried coconut. You can also press the dough mixture into a small baking dish, cool in the refrigerator, and cut squares out of it. 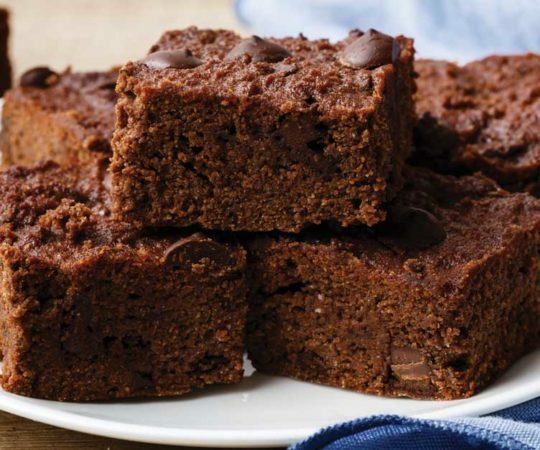 This simple recipe can make enough brownie bites to last you up to a week. Well, I guess that depends on whether you decide to gobble down three a day, but I just usually have one of these as an after-dinner snack, when I like to have something sweet. These are rich enough that I don’t eat 3-4 of them like I would want to with regular chocolate cookies. They also make a good afternoon energy boost. 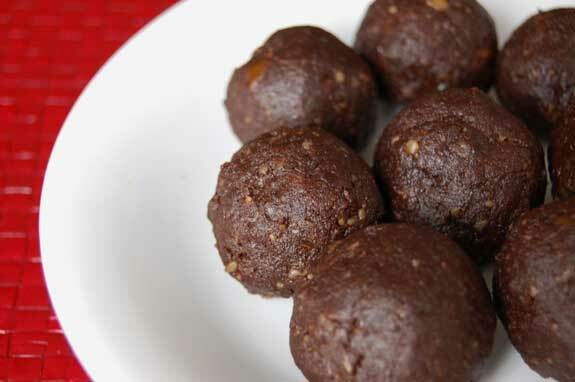 These raw brownie bites have a lot of fiber, protein and healthy fats, versus a highly sugary substitute. These are best eaten cold, so refrigerate the bites after making them, instead of immediately consuming. They should be stored in the fridge in an airtight container. 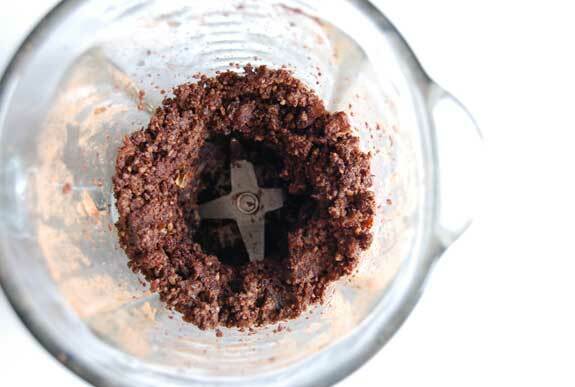 Add the dates, vanilla, and cocoa powder to the blender. Mix well until everything is combined. With the blender still running, add a couple drops of water at a time to make the mixture stick together. Using a spatula, transfer the mixture into a bowl. Using your hands, form small round balls, rolling in your palm. Store in an airtight container in the refrigerator for up to a week. What are these brownie bites’ calories? I got something similar to Yvonne. 18 brownie bites at 95 cal each. I plugged it into the calorie calculator on myfitnesspal and got: Carbs 8, Fat 7, Fiber 2, Protein 2, Sugar 5. The combination of the date mixed with cocoa powder makes the bite taste like pure sweet chocolate.. since dates are so sweet..
Add the walnuts. It so satisfied your sweet tooth.. I love these .they will be my quickie go to treat. FYI, Dates are so sticky, I didn’t want to waste the fig by putting in blender. So I mixed cocoa and nuts in small bowl and mixed up with 1 date at a time.. mixing well and then rolling with palm of your hands. Thank you! These are fantastic for curbing a chocolate craving. They are a wonderful treat for kids too. Excellent snack, will reblog on my site! I have a question, based on the ingredients I’m seeing listed, they’re all ingredients that have a very long shelf life, so I’m wondering why they would only keep for one week. Is it possible to keep them longer whether refrigerated or not? Separately they might last a long time but when the dates, vanilla, and water are all mixed together I would keep them in the refrigerator, though they may last a little longer than one week. Mine never make it that long! I love this recipe! I used dark cocoa and it mad it rich like a truffle. When i want just a little more sweetness, i add about a tablespoon of really ripe banana. Just enought to sweeten it without making it a chocolate covered banana flavor! YUM! Made these tonight – YUM – Even tho my food processor did nearly have a heart attack in the process!! I had to mix it all in 3 batches. 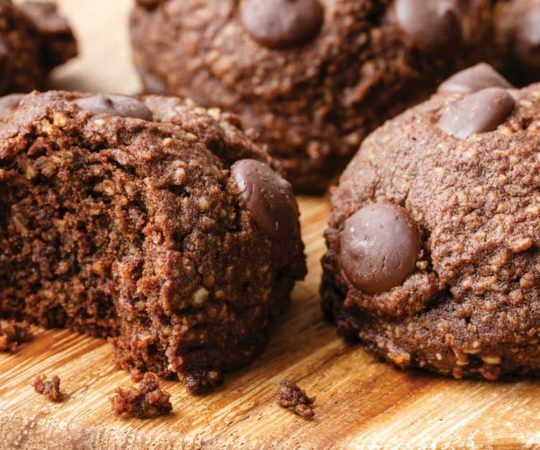 Worth it – am going to work the dreaded night shift in five minutes so have packed some of these for a nice paleo 3am pick me up lol Many thanks for the recipe. Will pin it!! I thought we couldn’t have cocoa powder on paleo. i’m so confused. I’m only new to all of this and I share the same thoughts. Cacao powder is closest you can get to natural where as all the recipes are using cocoa powder, which is more processed. Unsweetened cocoa powder is harder to find than the regular stuff, but it is allowed on Paleo. Wow! I mean, wow! These are ridiculous they are so good and so easy to make. I keep a stash in the freezer and they freeze beautifully. These are seriously amazing! Thank you so much for getting me off the chocolate bar addiction! Can you sub pecans for the walnuts? Very happy to hear that pecans work as well – sometimes whatever is in the pantry turns out great! Mmm, just made these. I used roasted hazelnuts because, you know, Nutella. Mmhmm, good decision. I wanted a little more sweet, so I added apple juice concentrate in lieu of the water. So delicious, so satisfying. Thank you for a great recipe! Could you substitute the dates for something else? I really hate dates! Hmm, that is a tricky question! The only other thing I could think of would be perhaps trying figs. I am not a big fan of dates either, but the taste of cocoa and nuts overpowered the dates. I didn’t feel them at all. The dates are very very sweet (that’s why I don’t like them), and the sweetness is what they bring to this great recipe. I substituted raisins for dates one time and it turned out tasty. Changed the taste some, but my kids really couldn’t tell. I substituted prunes for the dates. Worked very well. Not as sweet as the dates might make it. Made these brownie bites tonight and they rocked! Thanks. Great to hear! The only hard part is not eating all of them at once. Omg! I just made these. yummy!!!! I ran the recipe through calorie count and it says there are 217 calories per serving. However I got 16 balls instead of 8 so mine have about 106 calories each. Sooooooooooo good!!! I used cashews – no regrets. I can’t eat nuts or seeds – bummer allergy! Any ideas for substitution? Shredded coconut? Maybe try coconut butter or shredded coconut? Both will give a different texture from each other as well as different from the nuts, but it might work. These we’re AMAZING!!!! I didn’t have walnuts so I used almonds and it still turned out great. 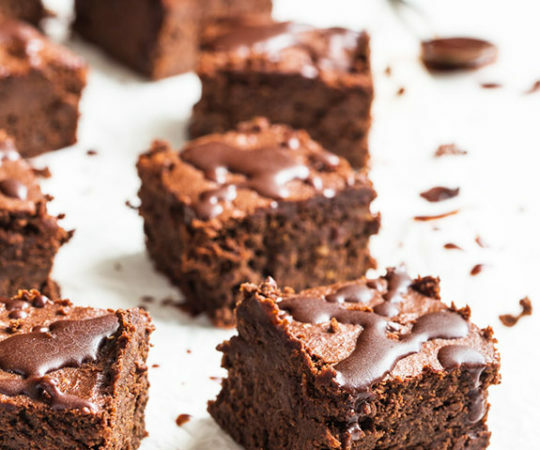 I don’t need regular brownies with this delicious bites!! Thanks!!!! These are amazing! So simple, so quick. My 4-year old loves them. It’s nice to find a healthier alternative for the little ones. Thank you! Tried these for a much needed chocolate fix and they were AWESOME! I didn’t have walnuts so I used pecans, delicious. Also didn’t have dates, so I used raisins and added a spoonful of coconut sugar for extra sweetness. I rolled them around in extra coconut sugar and let them set in the fridge. Not only did they look like expensive truffles, but they tasted just as good! This is my new go-to snack for chocolate! These were great! I actually changed the recipe to support my workout schedule. I used 1/2 c walnuts and 1c vanilla whey protein powder instead. I then used 3/4 c dates and followed recipe according to rest of the ingredients. They were delicious and the consistency was perfect! Just an idea if you are wanting a more protein filled snack. thanks for these great recipe. Mine taste amazing but I had some problems while mixing them. I had to pause and push everything back to the bottom in order to get cut by the knives. Did I do something wrong? I mean it is different to try to blend stuff without liquidity right? Any advice? I was craving chocolate in a bad way, and this saved me. This is my first Paleo dessert, so thank you for making it an outstanding first. These look delicious! trying them this weekend. Is that vanilla essence or fresh vanilla you have listed in the recipe? These are sooo awesome!! Taste like Monkey Poo cookies!! Made these tonight after my first week on Paleo (anyone else feel starving all the time at this point?). Struggling not to cheat, trying to stay committed to support my wife, and these may have saved my life. Not nuts, rolled in Cocoa powder… yum! I plan on doubling the vanilla and maybe adding cinnamon on the next round (perhaps even some banana). Thanks for sharing. How do you think these wld taste to leave out the cocoa and add vanilla protein powder? 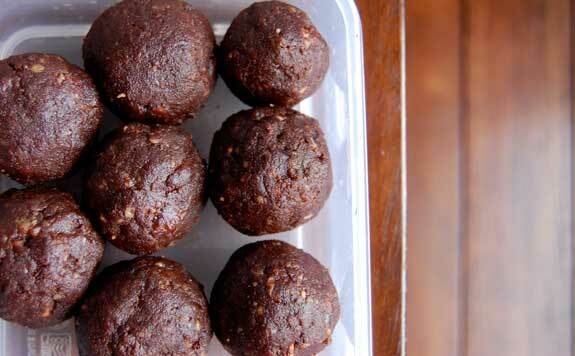 This is the best treat I’ve made so far using Carob powder. Instead of the Cocoa powder I used Carob powder which is not my favorite compared to chocolate and I added 1 tsp of Nielsen-Massey pure chocolate extract and a little more than a pinch of sea salt. Best chocolatey tasting thing I’ve made with Carob powder so far! Will definitely make again!! When you say vanilla, do you mean like vanilla extract, vanilla bean, or vanilla whey protein..? Im new to this cooking thing. Oh my goodness! These are AMAZING! Thankyou SO much for this recipe! They definitely did the trick! This was my first Paleo Grubs recipe and it was incredibly yummy! Made them for the first time a few nights ago and added way too much water…had to kind of squeeze the excess out before forming each ball but they were still very good. Rolled a few in ground unsweetened coconut flakes, which made them even better. Did not add water in my second batch but did stream in a bit of pure maple syrup, then rolled some in ground pecans and some in the coconut. This batch was very good, but I almost liked the texture/consistency of my first batch that had too much water, as those were softer, like a very moist brownie. This recipe seems like it could be very versatile…can’t wait to try lots of different nuts, flavorings and additions, such as dried tart cherries. Loved the banana idea that one poster mentioned. I took some of my second batch as a gift to my favorite doctor’s office during my recent appointment and everyone loved them! I was excited to try this recipe, and it certainly lived up to it’s expectations! I made smaller brownies so I got about 16 from the batch. Sadly, I ate 13 brownies in 2 days & only shared 3. What can I say, it had been over a month since I started Paleo and this ex-chocoholic had some catching up to do! On the bright side, I got my 2 year old to like them- yay! OMG!! 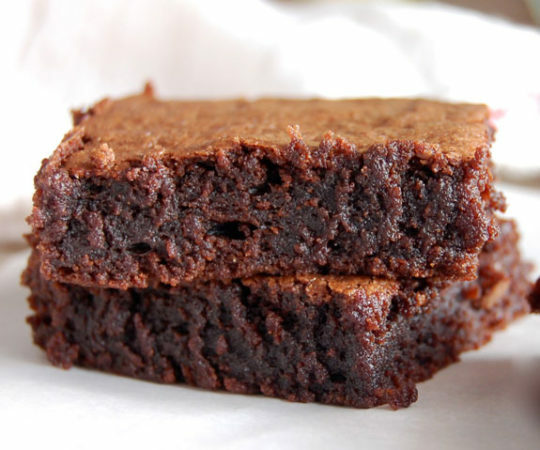 I am absolutely in love with these brownies! I made these tonight and can’t believe how great they are! 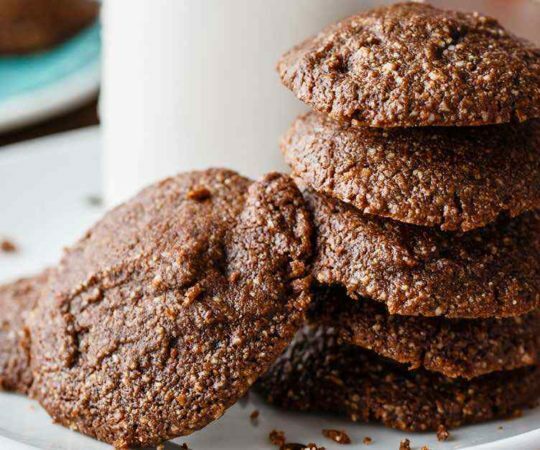 Who would have thought that just some nuts, dates, and cocoa powder could taste like this?? They seriously taste like brownies. Chocolate has been one of the hardest things for me to give up and these little snacks have changed everything for me. I doubled the recipe and added just a couple drops of stevia and was totally satisfied just eating 2. Chocolate crave is gone! Thank you Rebecca!! Mmm made these with soaked and dried hazelnuts and didn’t even see that I was supposed to add water. But they worked, and no, I couldn’t wait to eat them cold (not all, haha)! Thank you!! Wow this is very good! y blender couldn’t handle blending it as is, so I added unsweetened coconut milk to help it blend and made more of a pudding, but it was still soo delicious! best pudding ever! I just made these last night, I loved them, my picky daughters loved them and my health crazed husband loved them. I added a little more water since I couldn’t get the dates to blend, note to me, chop them up before going in the blender, so I put them in the oven at 250 for about 12-15 minutes. They smelled my whole house up like brownies and they were SO amazing! My oldest liked them best warm! Soak the dates in hot water for a few minutes. They soften up and are easier to pit and blend up nicely. OMFGoodness!!! These really ARE amaze-balls!!! My 8 and 10 yr olds kept trying to eat them all while I was trying to make them into balls! 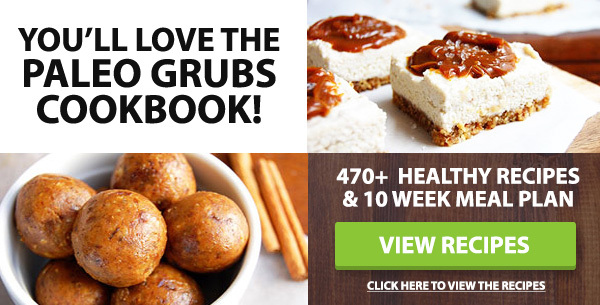 I am new to Paleo – and these will definitely help keep me on track! They are FATANTASTIC! I made them in my food processor and had no problem getting them to come together – didn’t need any water. I think using a blender would be more challenging. For those of you who struggled, give it a try in your food processor. I made these and they looked so delicious, but they came out extremely bitter… any way to sweeten them up? My family is making the shift away from the “conventional” way of eating and slowly shifting into a more healthier way. 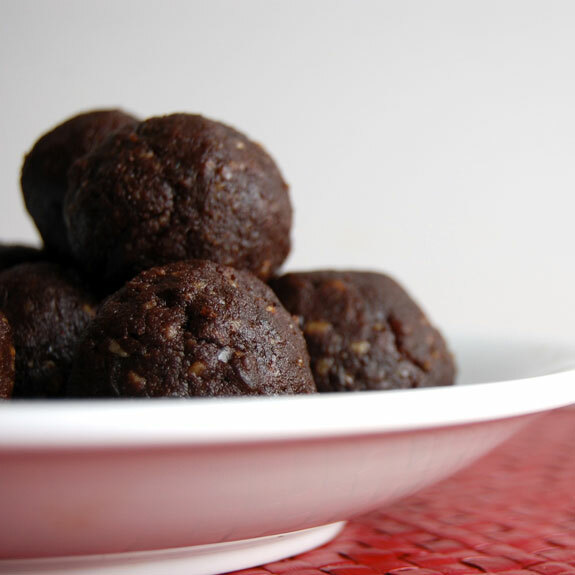 I made these yummy balls of goodness yesterday but used cacao instead of cocoa and added Chia seeds and Maca powder. We are only newbies and looking forward to many more recipes from you website to help us on our journey. These are awesome!!! I did roughly chop the dates prior to blending and doubled the vanilla. Didn’t have any issues with the amount of water just added it a tablespoon at a time until my food processor formed the mixture into a ball. Used a tablespoon measure to form balls and came up with 16 as previously commented on. This is definitely a must have recipe for all paleos! So easy to make, and taste soo goood! Sooooo good! I made them with almond meal instead of the walnuts as my hubby can’t have them. Everyone kept asking for more! Thank you for this! I’ve made these a couple of times. Last time I added dried apricots to the mix and rolled in coconut. They were even better than the original. Loved these! Made them for my kids as a store bought date brownie substitute. My 7 and 2 year old love them! Thank you they are easy and so much cheaper. I make these with organic almond extract in place of the vanilla…delicious..like them even better! Just tried making these today, after checking the measurements-more used to pounds and ounces, or grams. The original version, very dark and not overly sweet. Then adapted it to substitute the cocoa powder for ground almonds, the dates for dried apricots and the vanilla essence for almond essence. Also added 2 dessert spoons of honey. Really delicious! Absolutely love these. They were gone quick once I shared them with friends. I’ve been using pecans and will change up the recipe every now and then by making a chocolate mint flavor or an apple pie flavor. All are really easy and take 5 minutes to make. I’m addicted. I’m allergic to chocolate so can I sub Carob Powder for the chocolate? I made these yesterday and they are DELICIOUS! I added 1/2 cup more dates bc the cocoa was a bit too bitter for me, and I used a 1 tbsp scoop. Got about 20. Can’t be sure on count though bc my husband stole a couple as I was rolling them! They were a BIG HIT at our house. Thanks for the excellent recipe! My first Grub recipe – Made it for my Mahjong Group and WOW. – So Yummy!! I put a squirt of honey and it is yummy! They don’t look pretty but they taste great! These brownie bites are amazing! They really hit the spot when I was craving a sweet treat. Yummarama! These are so good. I had to ration them for myself, no more than two a day. I made them smaller so I could have them around longer. Great recipe! Thanks! Could I use cacao instead of cocoa? These are absolutely perfect! I have made them with almonds and pecans, and both were great. Amazing recipe! Tried it for the first time using almonds and medjool dates. Didn’t have a food processor so everything was done by hand. Added espresso powder. Yummy mocha bites! I just made these for the first time and OH MY!! WOW these are great but I tweaked the recipe a little. I used pecans vice walnuts and honey instead of water. This recipe is a keeper! I didn’t expect to have walnuts in this brownie recipe, but I’m still gonna try it. I try to avoid food with wheat flour. Stay healthy everyone! I subbed in cashews instead of the walnuts. Added some unsweetened coconut flakes. Came out wicked good…as we say up here (heyah) in Portland, ME…. These are delicious! So simple fast and yummy! These are decadent! I have been experimenting with an anti-inflammatory diet and haven’t had ANY processed sugar (only honey and maple syrup are allowed in moderation) in 2 months. I stopped craving it a couple of weeks into it so I hope the sweetness of these don’t tempt me to try other deserts. These are so sweet that you could probably add more nuts and still have a fine treat. I’m going to experiment with it. Thanks for posting this recipe – it will be my go to for a treat from now forward.